A Change Is In the Make – due to increasing competition among tech companies working on AI, several software makers are inventing their own new hardware. A few Google servers also include chips designed for machine learning, known as TPUs exclusively developed in-house to ensure higher power and better efficiency. Google rents them out to its cloud-computing consumers. Of late, Facebook too shared its interest in designing similar chips for its own data centers. However, a big player in AI world, Microsoft is skeptical if the money spent is for good – it says the technology of machine learning is transforming so rapidly that it makes little sense to spend millions of dollars into developing silicon chips, which could soon become obsolete. Instead, Microsoft professionals are pitching for the idea of implementing AI-inspired projects, named FPGAs, which can be re-modified or reprogrammed to support latest forms of software developments in the technology domain. 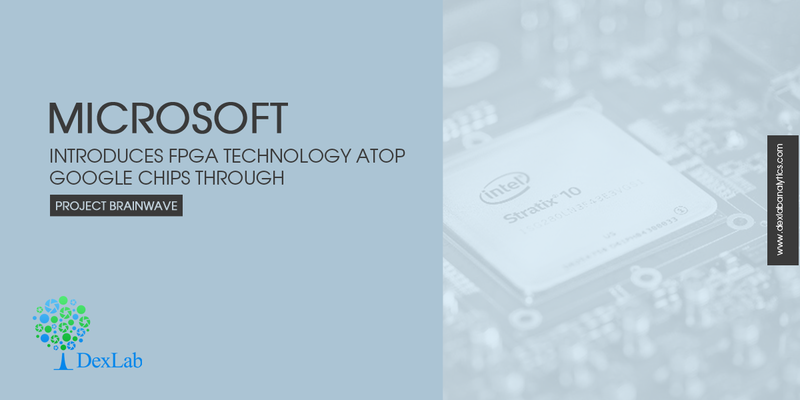 The company is buying FPGAs from chip mogul, Intel, and already a few companies have started buying this very idea of Microsoft. This week, Microsoft is back in action with the launch of a new cloud service for image-recognition projects, known as Project Brainwave. Powered by the very FPGA technology, it’s one of the first applications that Nestle health division is set to use to analyze the acuteness of acne, from images submitted by the patients. The specialty of Project Brainwave is the manner in which the images are processed – the process is quick as well as very low in cost than other graphic chip technologies used today. It’s been said, customers using Project Brainwave are able to process a million images in just 1.8 milliseconds using a normal image recognition model for a mere 21 cents. Yes! You heard it right. Even the company claims that it performs better than it’s tailing rivals in cloud service, but unless the outsiders get a chance to test the new technology head-to-head against the other options, nothing concrete can be said about Microsoft’s technology. The biggest competitors of Microsoft in cloud-service platform include Google’s TPUs and graphic chips from Nvidia. At this stage, it’s also unclear how widely Brainwave is applicable in reality – FPGAs are yet to be used in cloud computing on a wide scale, hence most companies lack the expertise to program them. On the other hand, Nvidia is not sitting quietly while its contemporaries are break opening newer ideas in machine learning domain. The recent upgrades from the company lead us to a whole new world of specialized AI chips that would be more powerful than former graphic chips. Latest reports also confirm that Google’s TPUs exhibited similar robust performance similar to Nvidia’s cutting edge chips for image recognition task, backed by cost benefits. The software running on TPUs is both faster and cheaper as compared to Nvidia chips. In conclusion, companies are deploying machine learning technology in all areas of life, and the competition to invent better AI algorithms is likely to intensify manifold. In the coming days, several notable companies, big or small are expected to follow the footsteps of Microsoft. For more machine learning related stories and feeds, follow DexLab Analytics. It is the best data analytics training institute in Gurgaon offering state of the art machine learning using python courses.